1. Preheat the oven to 200˚C, gas mark 6. 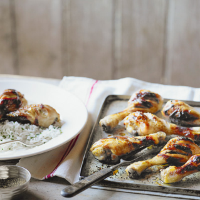 Score the chicken and place in a baking tray. Mix the lemon zest and juice, honey, garlic, oil and seasoning, and pour over. Bake for 30 minutes until the chicken is cooked through, with no pink meat. 2. Meanwhile, cook the rice according to pack instructions. Stir juices from the cooked chicken, the chives and seasoning into the drained rice. Serve with the chicken.